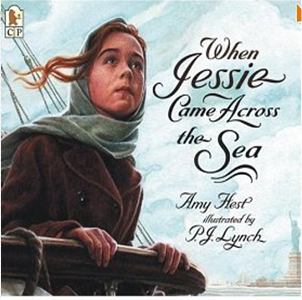 Most Jewish picture books for children that dealt with the immigrant experience are retelling the story of the Ellis Island arrival of Ashkenazi Jews around the turn of the 20th century. Berchick, by Esther Silverstein Blanc, was the first Jewish immigrant book not about the Lower East Side . Instead, this book centers around Jews who are homesteading in Wyoming in the early 1900’s. 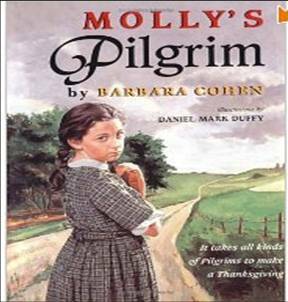 Molly’s Pilgrim, by Barbara Cohen, which is very still popular and wonderful book, is about a Soviet Jewish girl who is teased because of her Russian accent and her “different” ways. When the teacher assigns the class to each make a Pilgrim doll for Thanksgiving, Molly’s doll has the look of a Russian immigrant like herself. She says, “I’m a Pilgrim, just like the Pilgrims who came here to this country.” And they learn to understand what she’s experienced, as she also came to America to seek religious freedom. This is a short chapter book that would be good for second or third graders. It was also made into a picture book version. 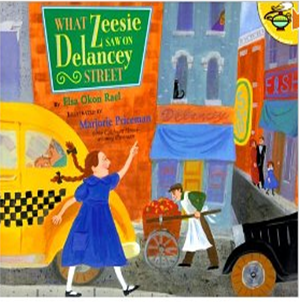 Others that are great immigrant picture books include What Zeesie Saw on Delancey Street by Elsa Rael, and When Jessie Came Across the Sea,by Amy Hest, which is particularly moving —and the art, by well-known illustrator P. J. Lynch, is so wonderful. 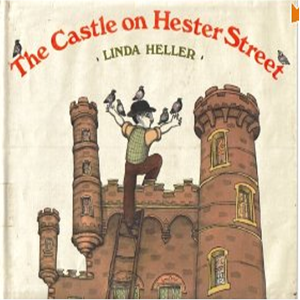 The Castle on Hester Street, by Linda Heller, was originally published by the Jewish Publication Society in 1982. The grandfather tells the trip from Europe to America and tells it to the grandchild in the most imaginative way, as if it were a fabulous adventure. But the grandmother, who is a realist, says, “That’s not how it was. We were in the steerage, we were uncomfortable, etc.” She’s down to earth, she’s the muckraker, she’s the nuts and bolts. He’s the one with the sky and the stars. But both parts of the story contain the truth, really. The book went out of print and the Jewish librarians asked publishers to reprint it. It was reissued in 2007 by Simon & Schuster with new fanciful illustrations by Boris Kulikov, that make it a lot of fun to read again. 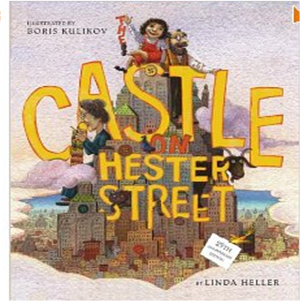 Both editions are on Kathe Pinchuck’s list. This entry was posted in Uncategorized and tagged Amy Hest, Barbara Cohen, Berchick, Elsa Okon Rael, Kathe Pinchuck, Linda Heller, Lisa Silverman, Molly's Pilgrim, The Castle on Hester Street, What Zeesie Saw on Delancey Street, When Jessie Came Across the Sea. Bookmark the permalink.